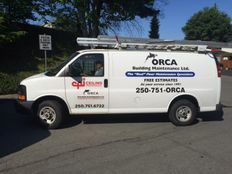 Based in Nanaimo, Orca Building Maintenance is your one-stop shop for all your cleaning and janitorial needs. Our team of friendly and well-trained staff offers an array of services, specializing in complete cleaning and degreasing of ceilings, as well as waxing and polishing of floors. We also provide round-the-clock professional cleaning services for commercial buildings and restaurants. **Please note: Janitorial services are only available in Nanaimo. Other services are available throughout the island. We serve clients throughout the Nanaimo, Duncan, Parksville and Comox areas. We are a fully insured and bonded company. In addition to services mentioned above, we offer ceiling restorations, sanitization and more. With a keen attention to detail, our staff provide a thorough clean for each and every client. We take great pride in ensuring your complete satisfaction. For excellent janitorial services, give Orca Building Maintenance a call for a free estimate on our services or to discuss your needs. Orca Building Maintenance specializes in comprehensive ceiling cleaning and restoration using products from Ceiling Pro. 24 Hours a Day – 7 Days a Week. Please call for an appointment.